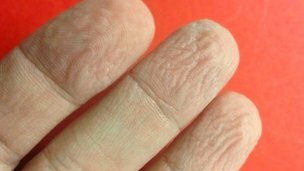 Learn One Thing A Day: Why do fingers wrinkle in water? 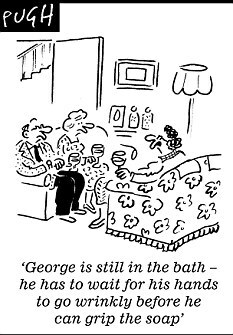 Have you ever wondered why your fingers wrinkle when you do the washing-up? As surprised as you might be, it seems that only recently scientists have found an explanation for this phenomenon. According to researchers of the Newcastle University, it could be the results of evolutionary development. The shrivelling of the skin on the fingers makes it easier to grip things underwater and pick up wet objects! So, when you do the washing-up without gloves and your fingers get wrinkled, it's just your body telling you "Sir, can I improve your grip on that soapy dish of yours?"